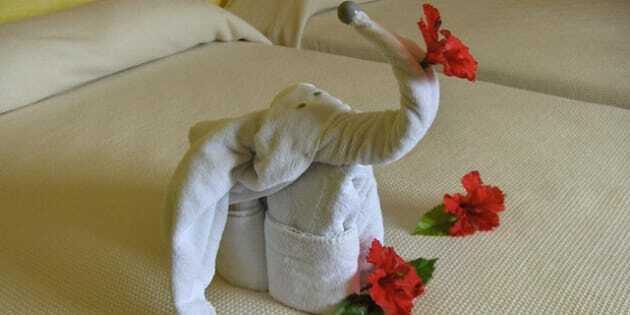 Wrapped in mystery, no one knows for sure how towel art first began. What is clear is why these creations, shaped by bath towels, face clothes and such, began to appear on the beds of hotels and cruise ships. They’ve become the calling card for housekeeping staffs all over the planet – a little something to say “I was in your room and did stuff while you were gone” and an amenity oodles more creative than a chocolate on your pillow or a card with tomorrow’s weather left during turn-down service. To fashion animals and flowers and such, towel artists take their inspiration from origami -- a 17th-century Japanese art of folding sheets of papers into mini-sculptures. Eventually, Carnival Cruise Lines popularized the craft some time during the '70s, leaving passengers dazzled and more likely to tip staff. These days, the cruise line’s stewards undergo a gruelling 10-hour training program of wrapping, pleating and folding. As for the DIY crowd, Carnival even published an 88-page book with instructions and photos on how to make 40 different creatures. Super keeners can pick up one of the many how-to book by Alison Jenkins, the Stephen King of towel origami tomes, through sites like Amazon.ca. Today, most cruise ships and top-end resorts have jumped on board and added their own twists on towel origami, with flower petals, ribbons, palm leaves, and stickers to amp up the wow factor with every towel folded. Results may vary, as seen in the gallery below, but hey, at least they're still handy for mopping up sweat and taking poolside any time.